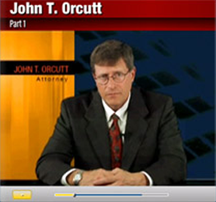 At the Law Offices of John T. Orcutt, we help good people during bad financial times. As a testament to that philosophy, for a limited time, we are offering to help get rid of your debt for $0 money down. No need to worry about attorney fees because this is $0 Money down and we even “advance the $315.00 filing fee so you don’t have to. This is a brand new one of a kind program so make an appointment today to see if you qualify. $0 Money Down Bankruptcy. Why pay more if you can get filed for $0 money down?